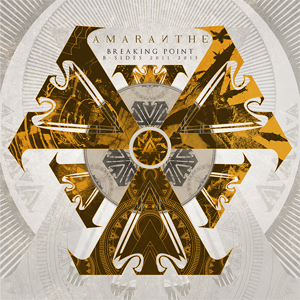 AMARANTHE will be releasing a digital-only compilation of B-sides on October 30, 2015. Breaking Point - B-Sides 2011-2015 will feature eight tracks. "As some of you know, AMARANTHE has recorded quite a few b-sides and bonus tracks throughout the years," guitarist Olof said. "We've always tried to keep the quality high, as something extra for our fans, but until now a lot of these tracks have been hard-to-find rarities, and quite spread out. We are now very excited to release a collection of some of the best b-sides and bonuses: Breaking Point: B-Sides 2011-2015. It focuses on some of the best acoustic renditions of fan favorites as well as a couple of originals from the early days! Enjoy this rare and different side of AMARANTHE!" Additionally, AMARANTHE will soon release a new video for the song "True", which lives on 2014's Massive Addictive and which is acoustically rendered on the B-sides release. "With the high-octane energy of singles/videos "Digital World" and "Drop Dead Cynical" we wanted a slightly more mellow third single," Olof explained. "The choice fell upon "True", which provides a great contrast with its hopeful yet melancholy lyrics and style. To match this with the perfect video, we once again turned to mastermind Patric Ullaeus, and the result is an inspiring and engaging take on how your dreams and visions don't always turn out the way you planned. But instead, there might be something greater than you hoped for down the line, as long as your heart stays true." AMARANTHE will return to the U.S. fall on an epic headline tour with BUTCHER BABIES in tow. Tour dates are below.